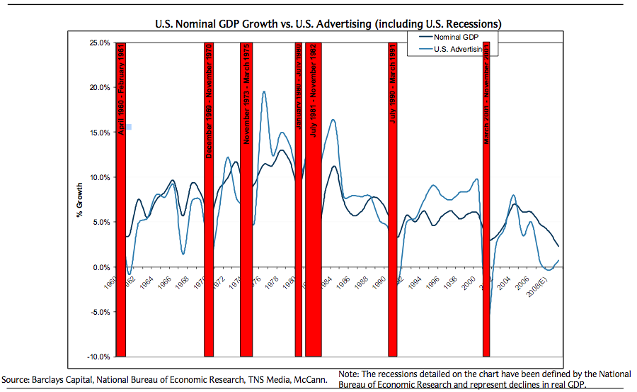 Earlier this month I wondered which companies might prosper in an advertising recession. Will history repeat itself in this recession? It is hard to know. Certainly lower CPMs can lead to lower customer acquisition costs if all else is equal. But the difference between this recession and the last one is consumer confidence, which is markedly lower today than in the 2000-2003 time period. As a result, there may simply be less buyers out there to acquire. So far it is looking like history may not repeat itself. As I noted earlier this week, consumer confidence is at an all time low, half the level of the trough in the last recession. “We got our asses handed to us starting about [middle of Septemer]. Before that was Ok. And we checked with our vendors who sell through [discount department store] and [big box retailer] and they confirmed — [discount department store] down 45% week over week starting about last monday, [big box retailer] down 35%. So for us . . . The exceptions to this trend in the survey are businesses that are actively adding SKUs to their product offering. Growth is the antidote to the slowing economy. This growth could come from adding new stores or product lines, new distribution channels or marketing channels, but it won’t come from the overall rise in online spending that has bouyed the category for the last few years. Posted by jeremyliew in game design, game mechanics, product management, usability. My talk was on building an application that rescued princesses. The goal was to give interaction designers some insight into how game design might be applied to the domain of more utilitarian applications. The notes fields are heavily annotated with more details about each visual. For those of you who attended, this deck also includes a third section on game design patterns that I didn’t have time to cover in the time allotted. What activities can be turned into games? Dan particularly recommends the Shufflebrain presentation. The Shufflebrain team recently launched Photograb*, their first game of their own, that applies many of their principles of game design. Check it out on Facebook. * Lightspeed provided the seed round of financing for Shufflebrain. Posted by jeremyliew in cost reduction, startups. PE Hub has an interview with one of the cofounders of Sherwood partners, a company that has helped close or restructure almost 200 startups. It includes some specific advice for startups looking to extend their runway. Once you know who is getting axed, what’s the best way to do it? If you do cut, you only try to cut one time. You cut deep and sharp because you have to build morale up and everyone left has to be comfortable that they have a job. Meaning you have to make all of your cuts at once? Can’t it be an iterative process? I’ve been doing this for 30 years and if you do it strong and deep one time, everyone complains for a period of time, then gets over it. Also, I’ll be honest with you, I’ve terminated people and two weeks later, I’ve brought them back and apologized for cutting too deep. Usually, they come back. It’s acceptable to be human as long as you’re not a jerk. Are there other, less painful, ways that can startups can reduce costs right now? You can cut the food that you’re giving employees. You can ask people to take a small reduction in their salary — or a large cut if necessary. You can stop giving away free services. The beta customers that are costing you 12 percent of your employee base — it’s time to ship up or shape out and you cut ‘em. Look at your electric bill. Are you running your utilities at night? Stop. You can negotiate with your phone service provider. We do it all the time, negotiate debt on unsecured creditors. It’s either: get nothing, or get something. People don’t want to litigate and sue. I go to companies and sometimes we get savings of 50, 60 cents on the dollar for a going concern. What about real estate? Should people be looking for cheaper rents? Now, can you do this when a market is hot? Absolutely not. But right now, do you think everyone isn’t a deer in the headlights? No one anticipated this tsunami. Anyone who says they saw this coming is a liar. There is lots more at peHub. Posted by jeremyliew in marketing, Search. 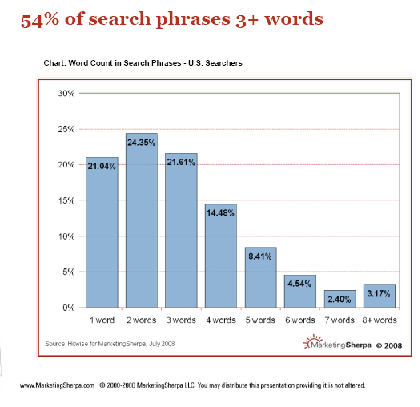 Well, if you actually look at the distribution of how many searches are out there based on how many words long they are, and you also look at the distribution of where marketers are putting their money, what you’re seeing is that almost 50% of searches are one or two words, and that same trend tends to follow in dollars spent. But, the interesting thing is that, if you actually pay attention to the way people convert and use the search engines, what they’re likely to do is: start out with a simple search, such as “MP3 player”. So, they get the search engine results page, see that there are multiple brands of MP3 players, and then from that, refine their search. And, maybe when they first made the search, they didn’t realize just how many MP3 brands were out there. But then, once they do the search, they realize that they’re really just interested in, let’s say, Apple iPods, at which point they refine their search, do three- or four-word search, such as, “Apple iPod in Chicago for sale”. So, once they do that, they’ve massively narrowed the field and get much more relevant search results. And those relevant search results result in much higher likelihood to click and much higher likelihood to convert after the click. Mention your brand in your search marketing. STEFAN TORNQUIST: … And this addresses one of the big questions that’s really been going back and forth between the search engines themselves and agencies, and, of course, the big brands, which is, does search have a brand effect? This is a chart that really requires some explanation. Tim? TIM McATEE: Yeah. Well, if you’re familiar with a dynamic logic or insight express brand effectiveness study– I think a lot of people who have worked in online advertising have seen these over the years. But what they do is, they go through and they compare a simultaneously collected control and exposed group, so that exposure to the advertising is really the only variable in between these two groups. And, then they attribute any difference between the control and exposed to the advertising, since there’s actually no other difference between the two. 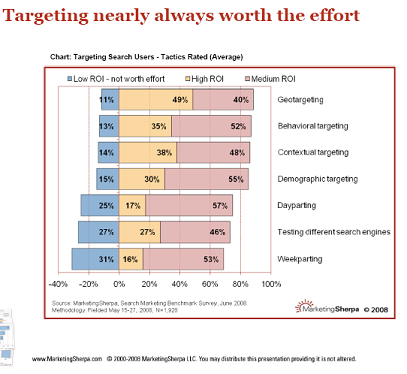 So, this chart in particular, this was a brand effectiveness study done looking just at search engine results pages. And, it was conducted by Enquiro for a major cell phone manufacturer. This particular question is actually looking at the likeability of the brand. So, they’ve actually asked, which of the following brands do you like best? Which do you like least? What we’re seeing is that the brand came in at 49% liked for control, but then increased, from 53% to 68% to 77% with multiple and all these different levels of exposure. So someone who just saw a side-sponsored link with just kind of a short…(inaudible) stashed off on the side, right there, that bumped it up a little bit there from 49% to 53%. 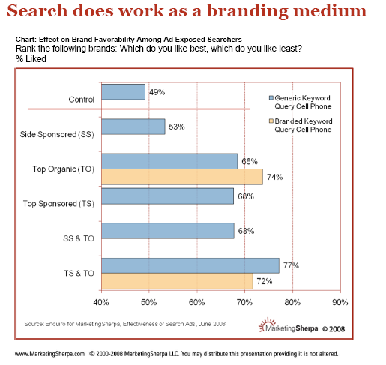 When the generic keyword or the branded keyword was in the top organic spot, we saw a massive jump there from 49% all the way up to 68% or 74% when it was in the top-sponsored as opposed to the side-sponsored. But the top-sponsored and the top organic, it jumped all the way up to 77% and 72%. So, the point being that, just being there on the page is definitely going to have some effects on the way people perceive your brand. Being in the top natural spot is huge. I think it’s kind of omission if you’re not there. If someone is to search for, say, cars, and your car brand doesn’t come up, I guess that just says something about your brand, that you haven’t optimized your search. So it really has to be there. These are just three of the nineteen slides in the presentation. The full presentation is here and the transcript for the presentation is here; worth checking out. Posted by jeremyliew in digital goods, game design, game mechanics, games, games 2.0, mmorpg, virtual goods, virtual worlds. UGC or First Party content? Subscription or a la Carte payments? Gameplay – Virtual goods are functional, part of the core game mechanics, and confer benefit in the game. Demand is driven by game mechanics alone, and requires a delicate balance to ensure that players with money do not always beat players with time, skill and passion. Merchandising – Virtual goods are not just functional, but also associated with self expression or attention in a noisy environment (see my previous post on the three use cases for virtual goods). This creates potential for greater demand for virtual goods, but requires the creation of a marketing and merchandising capability in the company. You can use these three questions to analyze existing businesses. For example, IMVU is a user-generated, a la carte, merchandising product. Habbo is first-party, a la carte, merchandising. Mob Wars is first-party, a la carte, gameplay. WoW is first-party, subscription, gameplay. Posted by jeremyliew in advertising, virtual goods. In recent years, marketers have set aside a portion of their ad budgets to experiment with digital technologies such as Web video, mobile phones, gaming and virtual worlds. But with broader economic turmoil reaching Madison Avenue, these “experimental” budgets are among the first to hit the cutting-room floor. Chrysler LLC has already slashed its experimental ad buys. With each ad dollar facing additional scrutiny, especially in the hard-hit auto industry, these ad buys will now make up about 5% of the auto maker’s marketing budget, down from as much as 10% in previous years, says Deborah Meyer, Chrysler’s chief marketing officer. In good times, the maker of Chrysler, Dodge and Jeep brands tapped technologies like gaming and mobile to build awareness of its vehicles. “We won’t experiment in a lot of things that are fun to have. All of our dollars have to go to hitting in-market shoppers with the appropriate media,” Ms. Meyer says. Areas like mobile, virtual worlds and widgets are expected to be hit particularly hard, as it remains unclear what kind of impact ads in these media have. These campaigns often reach a small number of people, and standard measurement systems have yet to be developed. “When we get into the need to drive results, you can’t spend money on the experiments and hope to keep your job and get your sales goals,” says Peter Kim, senior partner at Dachis, which advises marketers such as Philips Electronics NV’s Philips Healthcare and Johnson & Johnson on marketing strategies. If you’re trying to sell advertising that isn’t standardized, you should read the whole article. Ad executives say creating an entirely new form of advertising to put in untested places like virtual worlds — or three-dimensional online computer games — may not be worth the effort in tough advertising times. “Virtual worlds are probably one of the things that haven’t been proven effective just yet. I can’t see us selling virtual worlds to anybody right now,” says Lars Bastholm, an executive creative director at independent digital marketing shop AKQA. I hate hearing the term “user error”. Good usability testing should eliminate most user error. I am a big proponent of A:B testing with live users. However, often a small usability test can quickly highlight any big problems before you go live so that you are working from a better starting point. 2. Recruit representative users. If you’re testing a new user experience, Craigslist is fine for this [Tip – if your core user is a middle america, . But make sure that your testers are truly representative. Your existing user base is another good place to find testers, but make sure that you’re not just listening to just your loudest users. The key is to pre-qualify the users to ensure that they are “average”. 3. Do the test. First ask them what their first impressions of the site are. What captures their attention? What would they do first? Ask the users to speak out loud during the session, explaining what they are thinking at all times. Then ask them to complete the tasks that you have listed. Watch and listen. Note what they find easy, what they find confusing, and what they don’t find at all. This can be incredibly frustrating for you. You’ll think that some things are “obvious” that are not, or you’ll be shocked to see how unfamiliar users are with your site, or even with how browsers work. Remember that your role is to learn, not teach. Don’t touch the screen, the keyboard or the mouse; don’t point out how to do anything (even when they are “doing it wrong”, even if it is a “basic mistake”). You can provide encouragement and reassurance, or ask questions about why they did something, but that is it. You’ll be surprised at what you see. The key is to internalize that there is no such thing as “user error” and there are no “stupid users”. If users are having problems achieving the tasks that you laid out for them, then the fault lies with your site. You’ll need to review your UI. I prefer to do these usability tests over webex with users at their own computers. This makes the interaction as natural as possible for the testers. As an added bonus, you can then record both their screencast and the phonecall for later review. Usability testing does not have to be a lot of work/ You only need to test five users to uncover most usability problems. You want to run multiple tests because the real goal of usability engineering is to improve the design and not just to document its weaknesses. After the first study with 5 users has found 85% of the usability problems, you will want to fix these problems in a redesign. Finally, the second test will be able to probe deeper into the usability of the fundamental structure of the site, assessing issues like information architecture, task flow, and match with user needs. These important issues are often obscured in initial studies where the users are stumped by stupid surface-level usability problems that prevent them from really digging into the site. This can all feel like overhead when all you want to do is launch. Trust me, it isn’t overhead. Getting this stuff closer to right the first time will only help you reach your goals faster. Posted by jeremyliew in advertising. The Internet Advertising Bureau released its 2Q08 revenue report showing a material slide in display revenue, which grew 5% Y/Y in Q2—down from 14% Y/Y in Q1. Search continued to take share, maintaining 24% Y/Y growth through 1H08. Total online advertising grew 13% Y/Y during 2Q, down from 18% growth in Q1 and declining sequentially for the first time since 2002. Our research suggests that the media recession is likely to last well into next year. As such, we are now forecasting that online advertising will grow 3% in 2009, with search up 13% and display down 5% Y/Y. Profy is more optimistic and proffers some anecdotal evidence, but I’m going with the stats over the stories on this one. Be ready.